Home &rtrif; Oral Health Care: Can access to services be improved? Oral Health Care: Can access to services be improved? Over the past five decades the oral health of Americans has improved. Most oral disorders and diseases are less common today than they were 50 years ago. 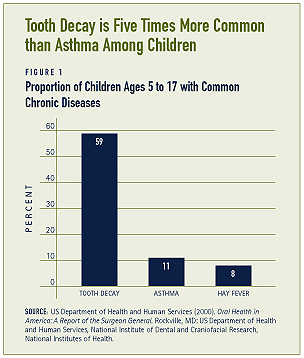 Tooth decay, however, remains the most common chronic disease among children ages 5 to 17. (1) Many oral disorders and diseases are preventable; yet, oral health has not been widely promoted. Furthermore, access to oral health care is limited, largely due to inadequate insurance coverage and a limited supply of providers. Substantial oral health disparities between populations of different income levels, ages, and cultures also exist. Increased attention to the prevention of oral disorders and diseases could improve the oral health of all Americans. An individual’s ability to perform basic activities may also be affected by oral health. Diseases such as tooth decay and periodontal or gum disease. Birth defects such as cleft lip and palate and missing all or most teeth. RChronic oral-facial pain which can result from disorders of the jaw joints and chewing muscles, such as Temporomandibular Joint (TMJ) Dysfunction or Craniomandibular Dysfuntion. Oral diseases are largely preventable. Water fluoridation and dental sealants are two cost-effective strategies that have greatly reduced the occurrence of tooth decay across many communities. Both of these efforts have contributed to significant improvements in the oral health of the U.S. population since the early 1960s. Some populations, however, do not have access to these strategies and are particularly vulnerable to oral diseases. Community water fluoridation is largely responsible for the prevention of tooth decay. Children in communities with water fluoridation have 29 percent fewer cavities, compared to children in communities without it. Water fluoridation is also cost-effective – the per capita cost of water fluoridation over an individual’s lifetime is less than the cost of one dental filling. Savings are substantial – every dollar spent on community water fluoridation saves $7 to $42 in treatment costs, depending on the size of the community. (4) Yet, over 38 percent – 100 million people – of the U.S. population do not have access to water that contains enough fluoride to protect their teeth. (5) Populations in geographically isolated areas generally have limited access to optimally fluoridated water. A large proportion of the population does not receive any dental care (see Figure 2). Some populations, including low-income individuals and racial and ethnic minorities, are less likely to receive dental services. Private dental insurance is primarily employment-based. Private dental care benefits are available to more than half – 59 percent – of full-time employees in medium and large businesses. In comparison, smaller businesses are less likely to offer dental coverage. (15) And, most employers of low-wage workers do not offer a dental insurance benefit. (16) In 1998, some 22.6 million employees were receiving employer-provided dental benefits. (17) Many older adults lose their private dental insurance when they retire – less than 20 percent of Americans age 75 and older have any form of private dental insurance. 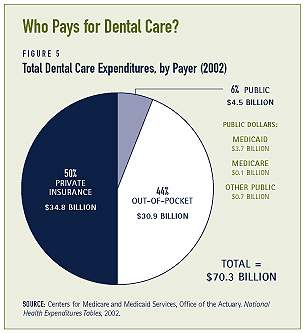 (18) As a result, many older adults must either pay out-of-pocket or forgo dental care or treatment. The Medicaid program – a program that is jointly financed by the federal and state governments and administered by the states – may be an option for some individuals with low incomes or disabilities who do not have access to employer-provided private insurance or cannot afford to pay the premiums. The Access to Baby and Child Dentistry (ABCD) program in Washington is designed to increase access to preventive and rehabilitative care for low-income children under age 6. The ABCD program is a unique partnership between the state Medicaid program, the Spokane Dental Society, the Spokane Health District, and the University of Washington. After attending a dental education program, families of the children are matched with a participating dentist who has been trained to provide care to yound children. In addition to being educated about the importance of maintaining good oral health, families are taught how to practice good oral hygiene, how to make and keep appointments, and how to help their children behave properly in a dental office. Individuals with private insurance are more likely to receive dental care. Some 70 percent of those with private insurance saw a dentist in the past year, compared to 51 percent of those without any dental insurance. The disparity between the privately insured and uninsured populations is even larger for children and older adults. Unmet dental care needs are also associated with type of insurance coverage. 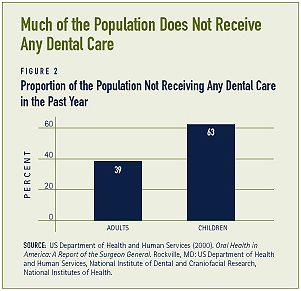 Almost one-tenth of the population wants, but does not obtain, dental care. 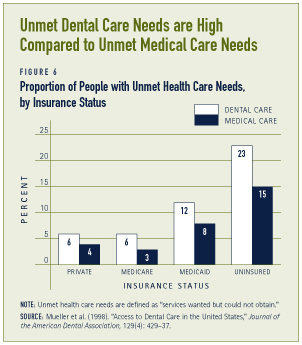 Unmet dental care needs are highest among individuals without insurance (see Figure 6). 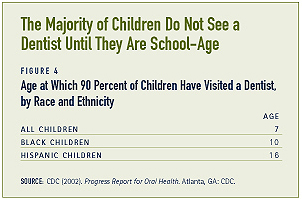 The lack of dental providers is a major barrier to obtaining dental care. There has been a significant decline in the number of practicing dentists over the past twenty years, and a projected decline in dental school graduates (see Figure 7a). Between 1986 and 1993, six dental schools closed, followed by one more in 2001. During this time, only one new school has opened. Dental schools have also experienced reductions in class sizes – the percent of graduating dentists declined by 40 percent between 1986 and 2000. (23) In addition to a general shortage of dentists, there is a shortage of dentists specializing in pediatric or geriatric care. Compared to the general population, racial and ethnic minorities are under-represented in the dental profession (see Figure 7b). Minority dentists are more likely to practice in minority communities. African-American and Hispanic-American dentists disproportionately serve African-Americans and Hispanic Americans, respectively, in their private practices. (25) Furthermore, patients are more likely to seek health care from professionals of a similar culture or background. 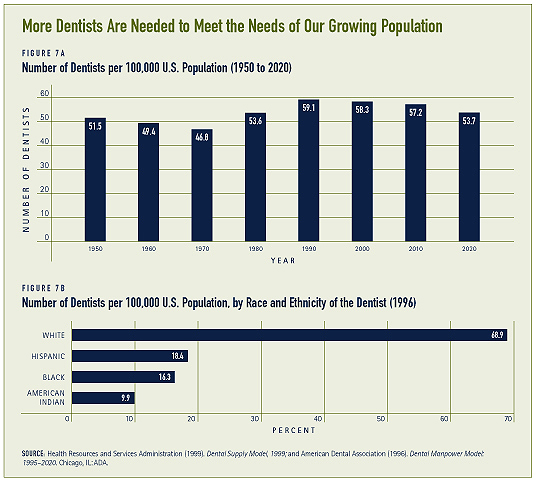 Substantial increases in the proportions of ethnic and racial minorities in the population heighten the need for a more diverse dental workforce. Additionally, dentists and their staff are more likely to need special skills, sensitivity, and competency to deal with complex cultural and social issues. Most state laws restrict the provision of preventive oral health services to dentists. Dental hygienists are allowed to provide a defined scope of preventive services, though state laws require them to be supervised by a adentist. Several states have expanded the duties of dental hygienists and assistants. Colorado, for example, allows dental hygienists to provide oral health services without the supervision of a dentist. Washington also allows hygienists to practice independently under certain conditions. Several states, including Michigan and New Mexico, have increased the number of Medicaid providers by raising reimbursement rates. The “Healthy Kids Dental” program in Michigan has increased both the number of dental visits by low-income children and the number of Medicaid providers. (30) The proportion of eligible children seeing a dentist has increased from 18 percent to 44 percent, and the number of providers participating in the program has increased by more than 300 percent. In recent years oral health has been gaining more attention. Although efforts to increase access to services are increasingly more common, there is still much work that could be done – at the individual, professional, and community level – to improve the oral health status of our population. 1. US Department of Health and Human Services (2000). Oral Health in America: A Report of the Surgeon General. Rockville, MD: US Department of Health and Human Services, National Institute of Dental and Craniofacial Research, National Institutes of Health. 2. R. Warren (1999). Oral Health for All: Policy for Available, Accessible, and Acceptable Care. Washington, DC: Center for Policy Alternatives. 3. US Department of Health and Human Services (2003). A National Call to Action to Promote Oral Health. Rockville, MD: US Department of Health and Human Services, Public Health Service, Centers for Disease Control and Prevention, National Institutes of Health, National Institute of Dental and Craniofacial Research (NIH Publication No. 03-5303). 4. Centers for Disease Control and Prevention (2002). “Preventing Dental Caries,” Fact Sheet. Atlanta, GA: CDC. 5. US Department of Health and Human Services (2003). 10. CDC (2001). “Oral Health for Adults,” Fact Sheet. Atlanta, GA: CDC. 13. Indian Health Service (2002). An Oral Health Survey of American Indian and Alaska Native Dental Patients: Findings, Regional Differences and National Comparisons. Rockville, MD: IHS. 16. S. Beetstra et al. (2002). “A ‘Health Commons’ Approach to Oral Health for Low-Income Populations in a Rural State,” American Journal of Public Health, 92(1):pp-pp. 18. Oral Health America (2003). A State of Decay: The Oral Health of Older Americans. Chicago, IL: OHA. 20. Center for Policy Alternatives (1999). “Dental Coverage Under Medicaid,” Fact Sheet. Washington, DC: CPA. 22. P. Milgrom et al. (unpublished paper). The Efficacy and Cost-Effectiveness of the Access to Baby and Child (ABCD) Dentistry Program in Washington State. 23. Association of State and Territorial Dental Directors (2003). “Access to Oral Health Services: Workforce Development,” Best Practice Approach Report. Jefferson City, MO: ASTDD. 27. National Association of Community Health Centers, Inc. Fact Sheet on Public Law 107-251 (S.1533). Washington, DC: NACHC. 28. FirstHealth of the Carolinas (2003). Dental Book. Available at: http://www.communityvoices.org. 30. ADA (2003). 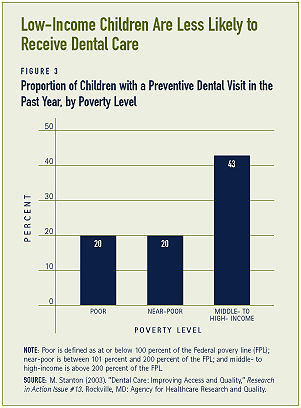 State Innovations to Improve Dental Access for Low-Income Children: A Compendium. Chicago, IL: ADA. 31. Health Consumer Alliance and Health Rights Hotline (2002). Denti-Cal Denied: Consumers’ Experiences Accessing Dental Services in California’s Medi-Cal Program. 32. FirstHealth of the Carolinas (2003). This is the sixth in a series of Issue Briefs on Challenges for the 21st Century: Chronic and Disabling Conditions. This series is supported by a grant from the Robert Wood Johnson Foundation. Lee Thompson wrote this Issue Brief. The Center on an Aging Society is a non-partisan policy group located at the Health Policy Institute at Georgetown University. The Center studies the impact of demographic changes on public and private institutions and on the financial and health security of families and people of all ages.